Loma Alta Open Space Preserve doesn’t land on most travelers’ itineraries, and for good reason: Tucked away between two residential neighborhoods in the sleepy towns of Fairfax and San Anselmo, this idyll of gurgling streams, beautiful forests, and crisscrossing trails is largely the province of locals. But its beauty welcomes anyone who seeks it out. While your friends admire the grandeur of Mt. Tamalpais or explore the charming streets of Sausalito, take the road less traveled and visit one of Marin County’s hidden treasures. Note: Since the trail isn’t much of a tourist attraction, don’t expect any tourist amenities. Neither nosy rangers nor pesky visiting fees exist at Loma Alta. Street parking is provided at the trailhead, but there won’t be maps, so make sure to bring your own. Though the hike is a constant and tiring ascent, the views you’ll enjoy are well worth the effort—and they increase in beauty as you climb. Snaking up Glen Fire Road, the trail passes small swimming holes and goes through verdant oak and bay forest until it reaches the junction with Oak Manor and Smith Ridge Fire Roads. As you skirt the edges of the water tanks there, admire the artwork on display—local youths use the structures as canvases for their graffiti. Continue up Smith Ridge Fire Road, over green hills bald as your poor grandfather’s pate, with pale igneous rocks jutting out of the earth like broken teeth. From this first ridge, you’ll glimpse San Anselmo, Fairfax, and perhaps San Geronimo surrounded by dense, dark green forests. As you continue your climb, the pale green of the early spring grass will become punctuated by Note the next major junction with Gunsight Fire Road, as you will take this steep path back to the trailhead. But for now, continue going up, as the best views are still in store. cCrops of budding wildflowers, rising from the soft earth and dappling the hills with orange, purple, and white speckles, soon punctuate the monotonous pale green of the early spring grass. AtNow reaching the second ridge, you can see farther, into Terra Linda, San Rafael, and Richmond. Once you cross the fence, you are outside of Loma Alta, and close to the top of the last, and most spectacular, ridge. From here, you may spot some grazing cattle, or perhaps a red tail hawk hunting for prey. Don’t stay too long, as the best has been reserved for last. The reward at the top is an unparalleled, breathtaking panorama of the entire North Bay peninsula: San Francisco and the cities of the East Bay, the San Pablo estuary, Mt. 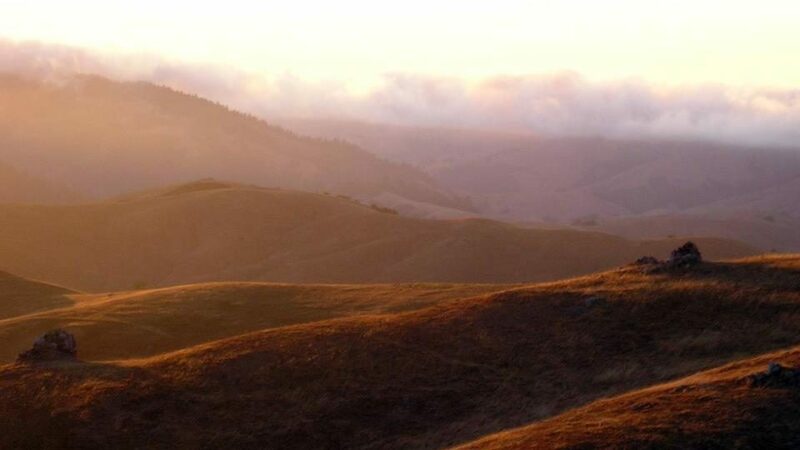 Tamalpais, and the wilds of West Marin… going all the way to the sea. Looping back down, take a left onto Gunsight Fire Road, which meanders slowly and steeply back towards the trailhead. As you approach Sir Francis Drake Boulevard, which is separated from the trail by a large gorge, make sure you look back and admire the heights from whence you came. Take a left at the next junction onto Fox Hollow Trail. Running languidly through bay forest the trail passes serene watering holes and green hills sprinkled with twinkling dew. This part of the trail is particularly good after a light rain, when the slight humidity in the air cools the skin and provides a welcome respite from the beating sun. Once you reconnecting with Glen Fire Road, you’re close to the trailhead. take a right back to the road. The end of your trail shouldn’t mean the end of your adventure. Returning to Fairfax, treat yourself at one of the town’s many quality eateries. There is an establishment for every price and palette, all locally owned and operated. An old town staple, Ghiringhelli’s Pizzeria (45 Broadway Boulevard) is the standard favorite for Friday nights and grade school lunches. From the simple cheese to the meat-lover’s, it’s hard to go wrong with one of these great pizzas. Equally excellent as suitable for a laid-back chill spot or a venue for business meetings, the Fair Fix Café (33 Broadway Boulevard) is the place to be for both young and old. With a menu of normal cafe food as well as Mediterranean-inspired dishes, you can’t really go wrong here. Personally though, I particularly enjoy the grilled chicken sandwich with the cafe’s special sauce. A traditional pub, The Sleeping Lady (23 Broadway Boulevard) serves up delicious food and good beer with a healthy dose of live music. The tasty burgers are made with local Prather Ranch beef. Check out the music schedule here. The ice cream at Fairfax Scoop (63 Broadway Boulevard) is probably the best in Marin—perhaps in the whole North Bay. Choose from a rotation of seasonally changing flavors, all made with love from locally sourced ingredients. My personal favorite is lavender honey. Directions: Take the Golden Gate Transit bus 101 to the San Rafael Transit Center. Transfer, and catch the 23 bus heading west. Disembark at the intersection between Sir Francis Drake Boulevard and Glen Drive, then walk up Glen Drive towards White Hill Middle School, and continue past the school parking lot. The trailhead starts at the end of the road.